ENGIE Services U.S., a division of global energy leader ENGIE, has a clear mission: helping its customers to save energy. It manages to do so at a large data center thanks to careful preparation and an eye for detail. Owen and her team set about analyzing electricity bills, existing hardware and software configurations, and consumption data from all the computer centers. They compared this data against the energy prices and energy-saving programs in the different states. “There’s enormous variation here, so it’s important to know exactly what rebates are available for energy-saving projects in which states, and how to get them.” ENGIE identified three data centers where modifications for greater energy efficiency would especially pay off, with one based in the US state of New Jersey. And then the work really got under way. 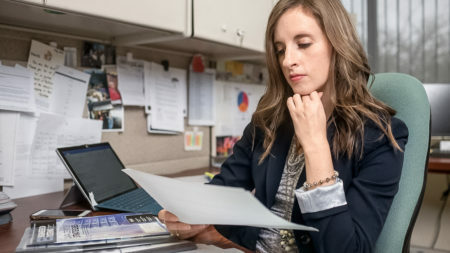 Danielle Owen, Director of Business Development Engineering at ENGIE Services U.S.
Once the project had been authorized by both the client and the auditing agency, ENGIE’s installation teams got down to business, implementing different measures in parallel. First, the lighting system throughout the data center was switched to LED lights. Improving the air flow through the center was a bit more complex. ENGIE made use of both active and passive measures here. 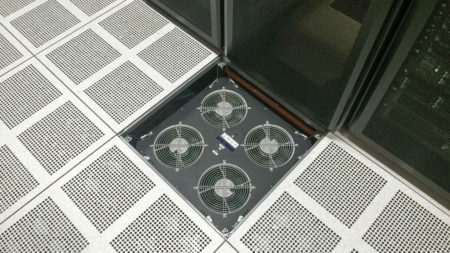 Active floor tiles are each equipped with four EC fans, which selectively channel cold air from the underfloor at specific points to the server racks. The passive measures included setting up cold aisles and fitting barriers that were installed wherever partially filled server racks would otherwise result in gaps in the cold aisles. The most important active measure was the introduction of so-called active floor tiles. These perforated floor panels feature fan trays each equipped with four EC fans, which selectively channel cold air from the underfloor at specific points to the server racks. All told, 324 of these elements were installed by ENGIE in the data center. “Controlling the air flow through a data center is an art in itself,” explains Owen. “Particularly data centers with lots of customers result in a huge variation in loads, which are also distributed over the building’s footprint. Investing in active floor tiles pays off here because they can be used to control the air flow far more precisely, allowing us to switch off consumption heavy air conditioners.” To make this process as efficient as possible, ENGIE equipped each floor tile with three temperature sensors which, like the Computer Room Air Conditioner (CRAC) units, are connected to the building control system. 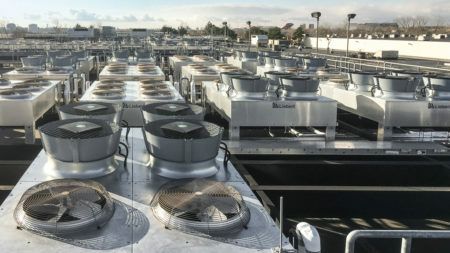 On the roof, ENGIE replaced old fans with 224 energy-efficient EC fans featuring AxiTop diffusers from ebm-papst. If the temperatures measured by the sensors are lower than required, the fans in the floor tiles slow down. When a rack starts to get too hot, the fans in the tile speed up again. If this is not sufficient, a nearby CRAC unit is brought out of standby and supplies more cold air. “Installing extra energy consumers in the form of fans may initially sound like a contradiction if you want to save energy. But the active floor tiles function so efficiently, using them really pays off,” explains Owen. While one team of ENGIE’s technicians was busy modernizing the interior of the data center bit by bit without interfering with ongoing operations, another was hard at work on the roof. There they removed the fans in the condensers, replacing them with 224 energy-efficient EC fans featuring AxiTop diffusers from ebm-papst. Colocation data centers offer customers a way to install their own server hardware in an optimum infrastructure. Companies without a data center of their own can still store their data securely and on their own hardware. For the operators of colocation data centers, this business model means they need air conditioning systems that offer a fast, efficient and flexible response to different load levels.